A. 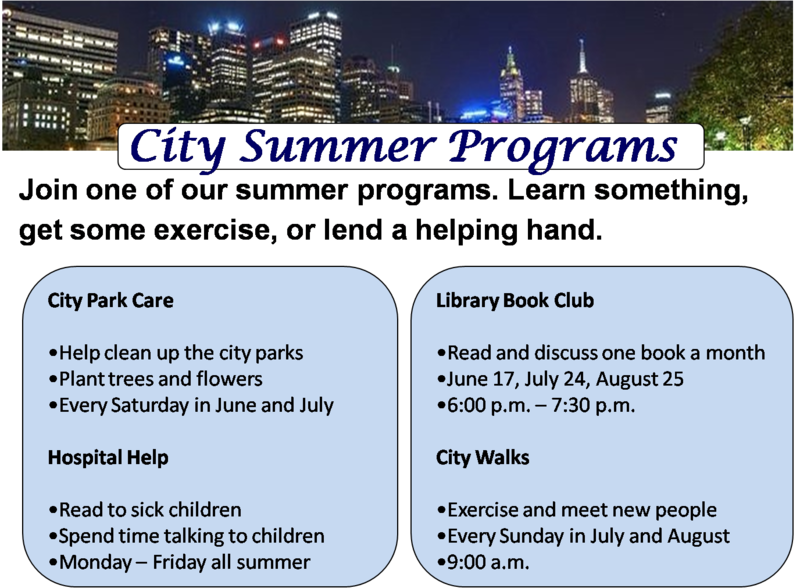 Read the notices about summer programs. B. Write an email inquiring about ONE of the programs above. · Open your email with Dear Sir or Madam and close your email with sincerely and your name. · Explain the reason why you are writing. · Clearly ask for the information you want to know. · Thank the person you are writing to. I would like to join the City Walks program this summer. It would be a great way to meet new people and exercise. I have read the information on your website, and I have a few questions. The website says the walks happen every Sunday in July and August. Would it be a problem if I couldn’t make it for two of the walks? Where are the walks? Do we walk the same path every week or do the places change? Also, it would be helpful to know how long the walks are and how difficult they are. Is the program for people with different ability levels? I would appreciate it if you could answer my questions and send me any other information you have about the program. This lesson is designed to analyse the structure and style of a formal letter of enquiry. Do advertisements provide all the information we need to make decisions? You are looking on the Internet for information about short English courses in the summer in England. You see an advertisement about a summer camp where you can study English and learn to play football at the same time. What information do you need before you can decide if you want to go on the course or not? Write down 5 questions. e.g. How long is the course? Now read the information below and find the answers to your questions. Did you find the answers to all your questions? Why do we write a letter of enquiry? You probably found the answers to some of your questions, but not to all of them. So, how can you find out the information you need? The answer is simple. Write a letter (or email) of enquiry! What are the sections of a letter of enquiry? A letter of enquiry typically has the following sections. Put them in the correct order. Now look at the following example letter and check. I am writing to enquire about your summer courses which I saw advertised in ‘English Today’. I recently took the FCE exam and I am now studying for CAE. Please could you tell me if you have advanced courses available? What dates do the courses start and how much is the cost? I will be coming from Vietnam. I would like to know what kind of visa I should apply for. I would also like to know more about the accommodation. Are single rooms available? Are meals included in the cost of a course? I would be grateful if you could send me more information about your school and the surrounding area. How do we ask questions and make requests in a letter of enquiry? Do you have advanced courses available? Please could you tell me if you have advanced courses available? What dates do the courses start? I would be grateful if you could let me know what dates the courses start. What kind of visa should I apply for? I would like to know what kind of visa I should apply for. Please send me more information. I would be grateful if you could send me more information. Look at the example letter again. Notice that we usually use a mix of indirect and direct forms. This produces a polite, yet clear letter. If we used indirect forms for all the letter, it would sound ‘wordy’ and lose clarity. Which indirect questions need a question mark? Look at the example questions and requests in the table above. Which ones have a question mark? Why? Now check your ideas below. Explanation: Indirect questions and requests have two parts. The first part is a polite expression, such as ‘I would be grateful if’. The second part is the question or request. To choose the correct punctuation, look at the grammar of the first part. If it is grammatically a question, use a question mark e.g. Could you tell me…? If it is grammatically a statement, use a full stop e.g. I would like to know… . How can I practice writing indirect questions and requests? Write the following questions and requests in an indirect (polite and formal) way. 1. Do you provide special training for goalkeepers? 2. I’m 19 years old. Can I take part in the football camp? 3. Do you have any camps for girls? 4. Send me a brochure. 5. My son doesn’t speak any English. Do you have any courses for beginners? 6. Will you pick my daughter up from the airport? 7. I’m vegetarian. Do you provide vegetarian meals? 8. Tell me the arrangements for health insurance. 9. Will I meet any famous players? 1. Please could you tell me if you provide special training for goalkeepers? 2. I am 19 years old. I would like to know if I can take part in the football camp. 3. Please could you let me know if you have any camps for girls? 4. I would be grateful if you could send me a brochure. 5. My son does not speak any English. Please could you tell me if you have any courses for beginners? 6. I would like to know if you would be able to pick my daughter up from the airport. 7. I’m vegetarian. Please could you tell me if you provide vegetarian meals? 8. I would be grateful if you could tell me the arrangements for health insurance. 9. Please could you tell me if I will meet any famous players? How can I practice writing a letter of enquiry? Look at the advertisement for the soccer school and your questions again. Write a letter to ask for information. Use your questions, or the questions from the exercise above. This material is provided by the Australian Centre for Education and Training (ACET).